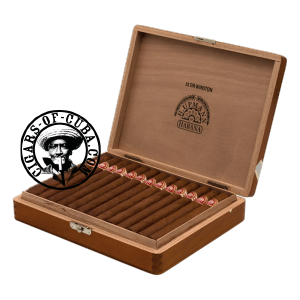 Regarded as a pillar among Cuban Churchills, the Sir Winston ranks up there with the Cohiba Esplendido or Punch Churchill. The construction is always perfect, meaning you can focus on the flavors and gradual power increase. The big size means this cigar should be aged for a minimum of 5 years to allow the blend to enrich itself. Beyond that point, this cigar just gets better and better. An ideal cigar to put away for a special occasion. Packaged inside varnished Boite Neutre with old style lock boxes, obviously designed for long term aging. Taste is typical H.Upmann, clean tobacco and subtle herbal flavors blend in perfect equilibrium. The Prime Minister of all Churchills, a classic!